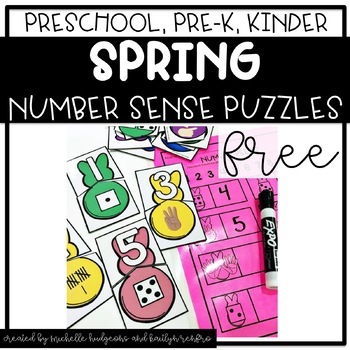 These Spring Number Sense Puzzles are a FREE activity for preschool, preK, or kindergarten. Students match the number puzzle piece to the correct quantity puzzle piece to complete each puzzle. What's included in this freebie? What do I need for this freebie? nothing :) just print, cut, and go! This freebie is part of the Spring Centers and Activities unitHERE. Thank you for downloading this free resource. Please remember to leave feedback :) Thank you so much. Follow Michelle Hudgeons and Kaitlyn Renfro to know of NEW preschool centers and activities releases!